The tens of trillions of microorganisms thriving in our intestines are known as gut microbiota, and those that are not harmful to us are referred to as commensal microbiota. In a recent paper in Science, NCI scientists described their discovery that, in mice, the presence of commensal microbiota is needed for successful response to cancer therapy. According to Amiran Dzutsev, M.D., Ph.D., one of the paper’s lead authors, the role of these organisms in the development of disease has long been established, but their role in the treatment of disease has never been shown. This study demonstrates, for the first time, “the critical role of the gut-residing microorganisms in the therapy of large subcutaneous tumors,” he said. The researchers found that subcutaneous tumors in germ-free mice or in mice treated with antibiotics, which depleted the population of their gut commensal microbiota, did not respond to several types of cancer therapy. “We showed that the efficiency of several types of cancer therapy, including chemotherapy with platinum compounds and immunotherapy with CPG, was diminished if the commensal microbiota was depleted with antibiotics, or when experiments were done in germ-free animals, deprived of any bacteria from birth,” Dzutsev said. C. Andrew Stewart, Ph.D., another lead author, further explained that commensal microbiota also helps regulate inflammation, which represents the body’s response to tissue damage and plays an important role in cancer development and growth. Future studies are planned to validate the role of commensal microbiota in humans, as well as the effect of antibiotics on cancer therapy outcomes. Evolutionary tree of mouse gut bacteria, with larger circles indicating greater abundance of bacteria. 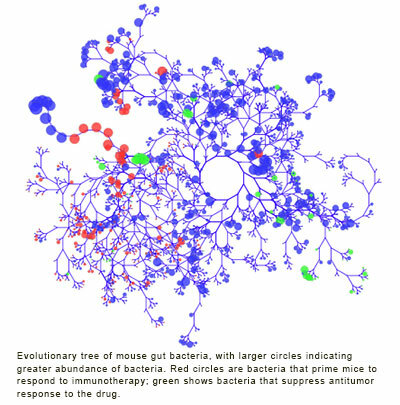 Red circles are bacteria that prime mice to respond to immunotherapy; green shows bacteria that suppress antitumor response to the drug. According to Dzutsev, physicians may already want to take extra precaution when prescribing antibiotics to patients who are about to receive cancer therapy. Other potential research directions, he said, include developing special bacterial ”probiotics” as an adjunct therapy to boost response to chemotherapy. Dzutsev, who received his medical training at North Ossetian State Medical Academy in Russia, and his doctorate in immunology at the Institute of Immunology in Moscow, completed his postdoctoral training at the Vaccine Branch at NCI before joining Leidos Biomedical Research in 2010 as a staff scientist in the LEI. Stewart specialized in mechanisms of target recognition by natural killer leukocytes at the University of Cambridge, U.K. He said he “developed a fascination in the processes by which the inflammatory and immune systems can distinguish tumors and cancer from normal tissues and how these processes affect development and treatment of cancer.” This fascination, he said, led to his five-year fellowship with Trinchieri. Stewart is currently a senior scientist with LeukoSight, Inc., in College Park, Md. Noriho Iida, Ph.D., was with NCI for nearly four years, first as a special volunteer and then as a supplemental visiting fellow in the CIP until the end of 2012. He is now an assistant professor at Kanazawa University Faculty of Medicine, Institute of Medical, Pharmaceutical and Health Sciences, in Japan. 1. Ackerman, J., How bacteria in our bodies protect our health, Scientific American 306 (6): 36, 2012,http://www.scientificamerican.com/article/ultimate-social-network-bacteria-protects-health/ (accessed 01/24/14). You can read the abstract to this article at PubMed.